The official name for the "Show me/Tell me" questions is "The Vehicle Safety Check" questions. This part of the test was introduced in September 2002, and the idea is to encourage drivers to learn a little bit about checking that their cars are safe before they head off on the road. You will be asked 2 questions from a total of 19. It is very important to remember that you will score 1 minor fault for getting one OR both of them wrong. You CANNOT be failed for not answering these question, for forgetting the answers or for getting them wrong. You will be asked 5 questions. You will score 1 minor fault for EACH of the questions you get wrong and if you get them ALL wrong you will score a SERIOUS fault and the test will be a fail. You will be asked the questions in the format "I would like you to SHOW me how you would....." in which case the examiner wants you to DEMONSTRATE how to perform the task in hand, or "I would like you to TELL me how you would....." in which case a simple explanation will be enough. You will not be asked to SHOW anything that might cause you to get burnt, hurt or dirty, and in any case the examiner will prompt you, or happily answer if you ask "Did you mean do it or tell you?" The following videos are from the Driving Standards Agency. They show an examiner with 3 students demonstrating the "Show me/Tell me" questions. Note that in your test the examiner will not want you to explain why any of the answers are correct, nor will be be worried about any technical names or jargon. He will happily accept you pointing to a particular switch and calling it "That Thing", or refering to bits on the car as "the wotsit" so long as you are pointing to the correct item. IT IS NOT A TEST OF YOUR ABILITY AS A MECHANIC! The DSA videos are very good and a quick way to learn the basics of the show me tell me questions, however for your convenience we have listed out the questions with pictures specific to the vehicles used by The Smart Way below. Some of the questions require you to be able to open the bonnet. For instructions on to do this, select your car from the group below. Open the Bonnet, point out the dipstick, and tell me how you would check the Engine oil level. This question is a "Tell Me". 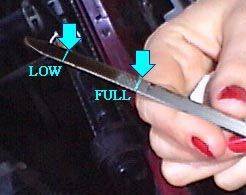 You will not be asked to demonstrate it, however you will be required to open the bonnet as above and point out the dipstick. You put the dipstick all the way back in place. Replace the dipstick, ensuring it sits properly. 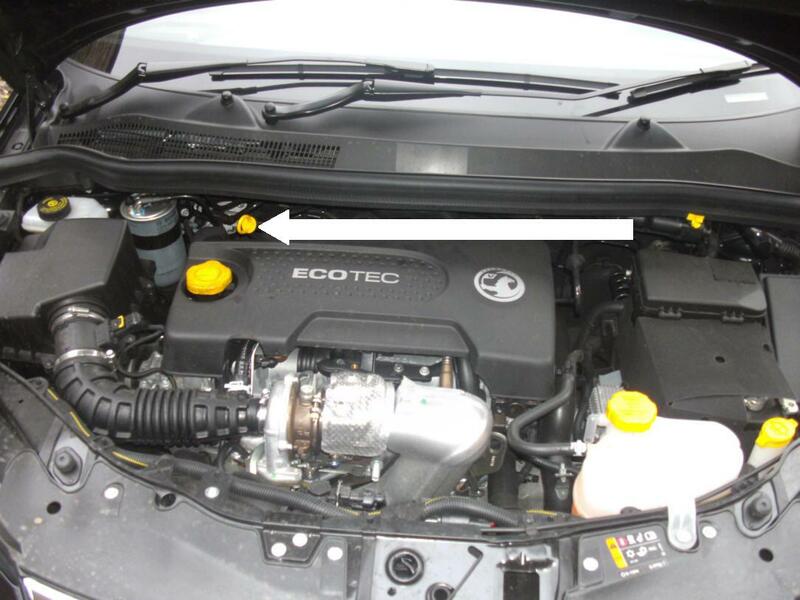 Open the Bonnet, point out the coolant tank and tell me how you would check the coolant level. 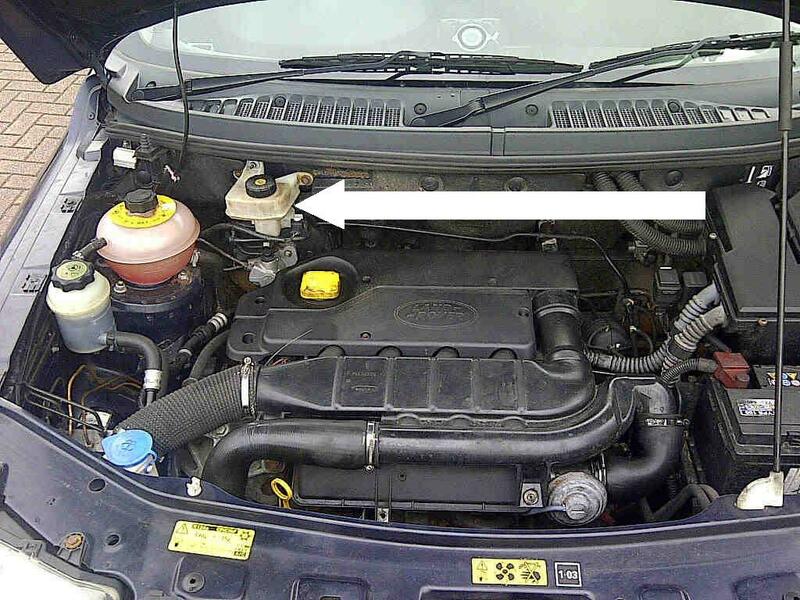 This question is a "Tell Me", however you will be required to open the bonnet as above and point out the coolant tank. 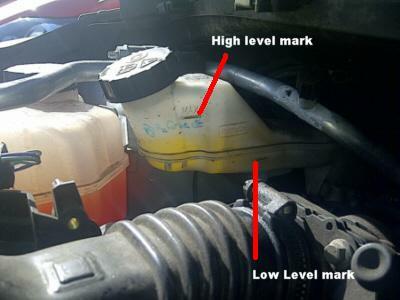 Open the Bonnet, point out the screen wash tank and tell me how you would check the screen wash level. Explain that you look at the tank, you can see the screen wash level and you ensure that the tank is reasonably full (there are no high or low level markers). 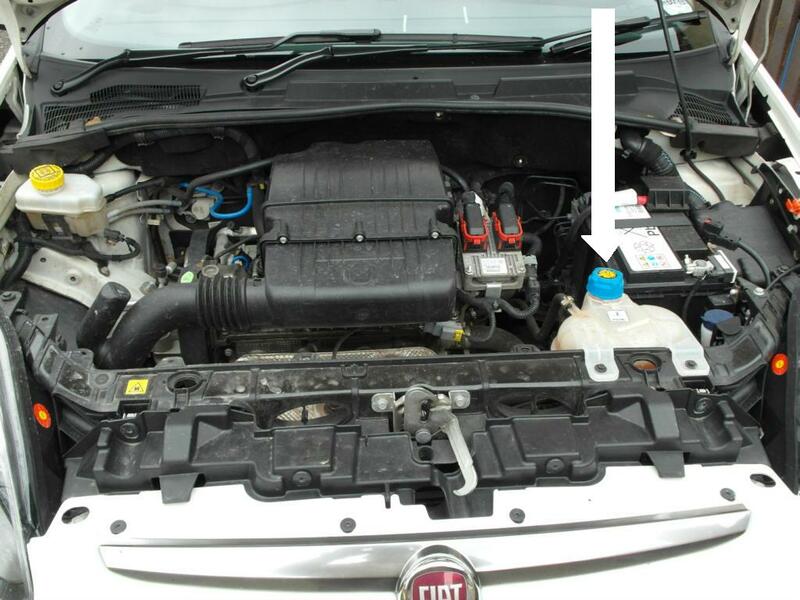 Open the Bonnet, point out the brake fluid tank and tell me how you would check the brake fluid level is correct. and you can see the brake fluid level. You ensure that it is between the high and low level marks. Tell me how you would test that the headlights and taillights on this vehicle are working. 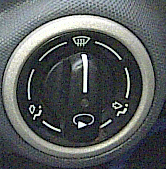 Turn this switch to the lights ON position as shown below. Then, quite simply you get out of the car and walk around the vehicle checking that the lights are on. Note that in the B+E (Trailer) test you must check the towing vehicle as well as the trailer lights. Show me how you would test that the indicators on this vehicle are working. 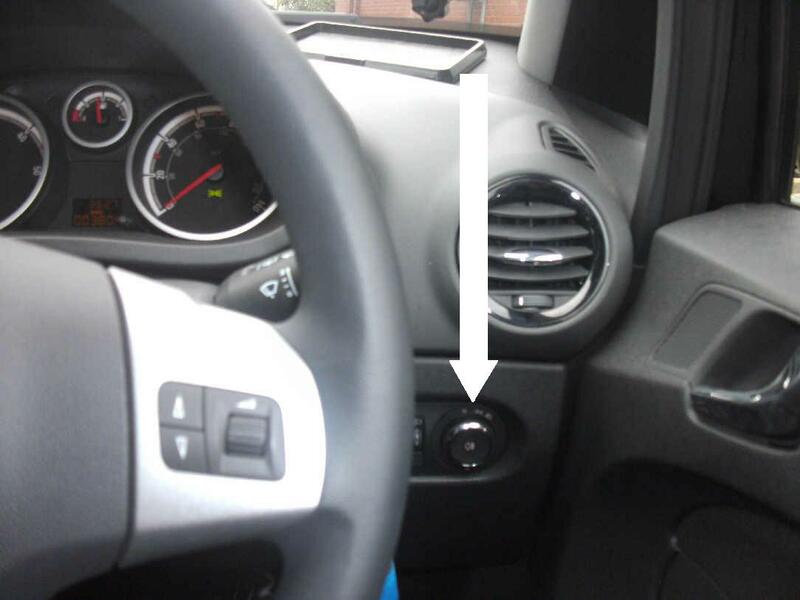 Turn the hazard lights on by pressing this switch in, then walk around the vehicle checking all the indicators are flashing, including any side or door mirror repeater lights. Note that in the B+E (Trailer) test you must check the towing vehicle as well as the trailer lights. Note - This question is a show me. The examiner will be check the indicators with you. If any of the indicators are not working on any vehicle it is a moving traffic offence and the examiner CANNOT take the car out on test knowing they are not working. This is not the examiner being awkward, its the law. Show me how you would test that the brake lights on this vehicle are working. For the brake lights to come on you must press the brake pedal. The problem is that you cannot see the back on the car from where you need to be to do this. Therefore there are a number of options, ANY of which are perfectly acceptable answers. You press the pedal while a friend stands at the back of the car and tells you if the lights are coming on. You reverse up to a reflective surface such as a garage door or a window, press the brake pedal and look for the reflections. Use something moderately heavy (such as a bag) to press on the brake pedal for you and look at the lights. It should not take a lot of pressure on the brake pedal to active the brake lights. Note - This question is a show me. The examiner will be your "friend" and will check the lights for you. If the brake lights are not working on any vehicle it is a moving traffic offence and the examiner CANNOT take the car out on test knowing they are not working. This is not the examiner being awkward, its the law. Second Note - On a B+E Test (car and trailer) you would be required to check both the car AND trailer brake lights are working! This check WILL be performed as a part of the trailer hitching excercise in the B+E test. Tell me how you would switch on the FOG lights in this car and tell me when you would use the fog lights. 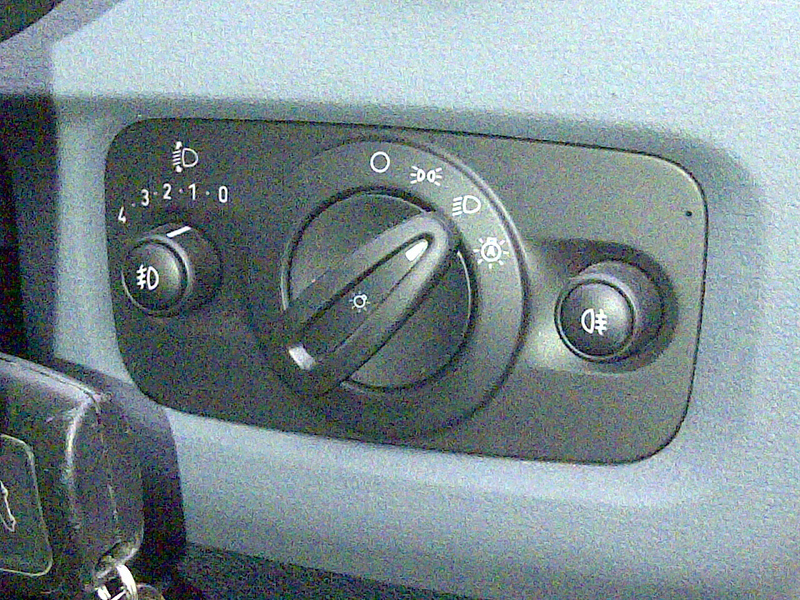 Locate the fog light switch(es) for your car (it is possible that your car is only fitted with a rear fog light, in which case you will have only 1 switch). Note - Some cars have 2 switches because they have front and back fog lights. Front and rear fog lights MUST be seperately switchable. 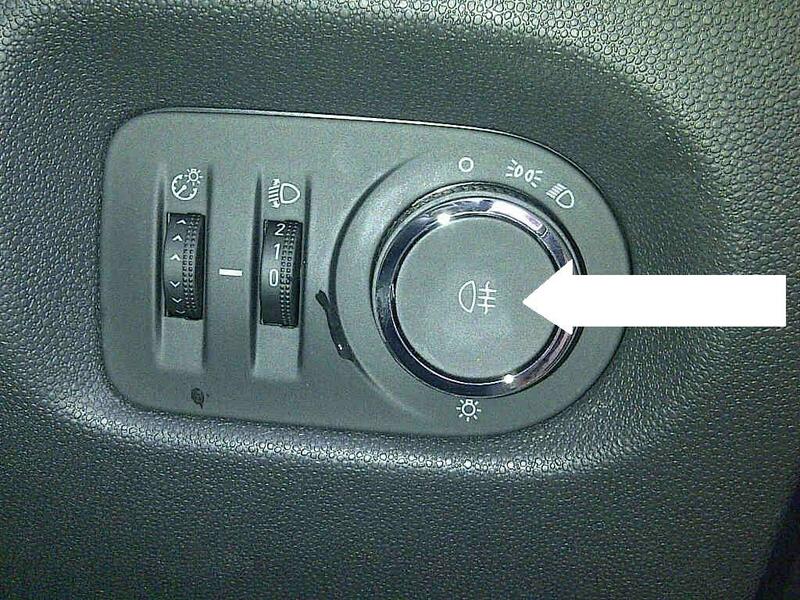 The law requires your car to have 1 working fog light at the rear, you do NOT have to have fog lights at the front. 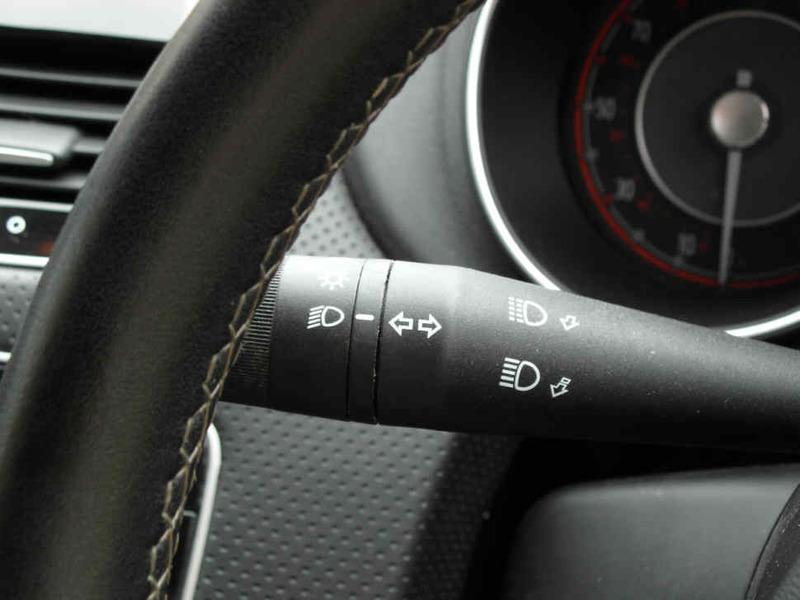 Explain that the fog lights will only work when the side lights or dipped beam lights are already on, therefore you would switch the side lights/dipped beam lights on first, then switch the fog lights on using these switches. You should ONLY put your fog lights on when the visibilty is less than 100 metres. Tell me how you would switch the high or main beam lights on in this vehicle and how you would know that they are on. 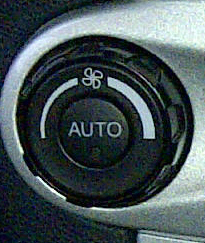 You pull the indicator up towards the steering wheel and feel a "click". 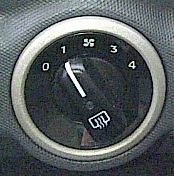 To switch them off pull the indicator to the steering wheel again. 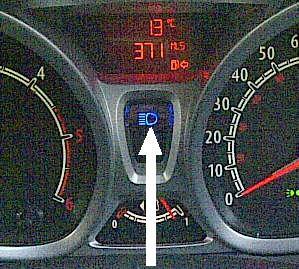 When they are on a blue indicator light will show up on the dashboard, (sometimes shaped like this below). This is the ONLY blue light on any car dashboard and ALWAYS means the high beam lights are on. If you try to put the high beams on without having the dipped beams on first you will simply cause the headlights to flash. Tell me how you would test the brakes on this car before going on a journey. Explain that you would press the brake pedal and check that the pedal feels reasonably firm, not soft or spongy. 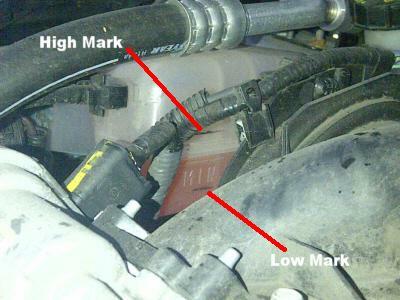 (This would indicate a leak or air in the brake system). Then, you would drive the car on a quiet road, at a low speed and press the pedal, making sure that the car stopped and did not pull to one side or the other. 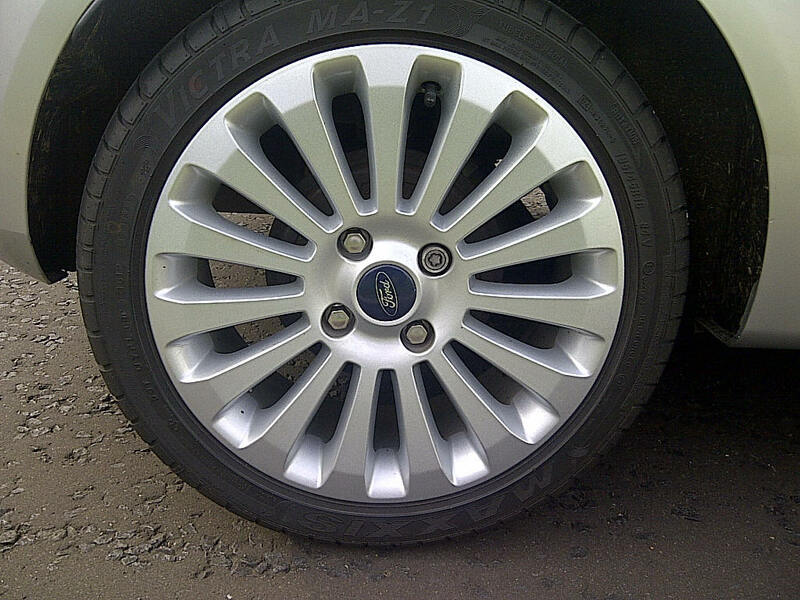 Tell me how you would check the hand brake on this car for excess wear. It should travel up about 4-8 clicks. There should be some resistance in the cable and the lever must not reach the end of its travel. With the brake on, it should be capable of holding the car on a moderate slope such as a home driveway. Tell me how you would know if there is a problem with the ABS on this vehicle. 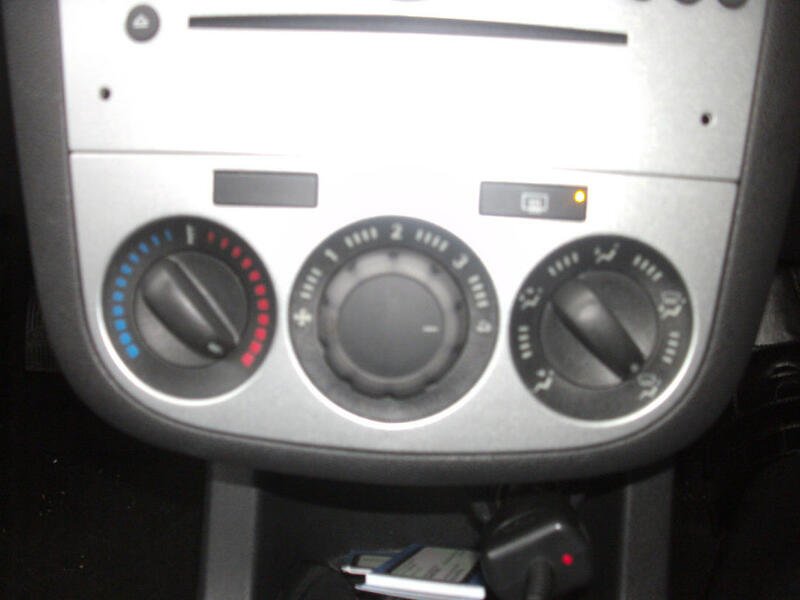 If the ABS is not functioning correctly a warning light will come on on the dashboard. 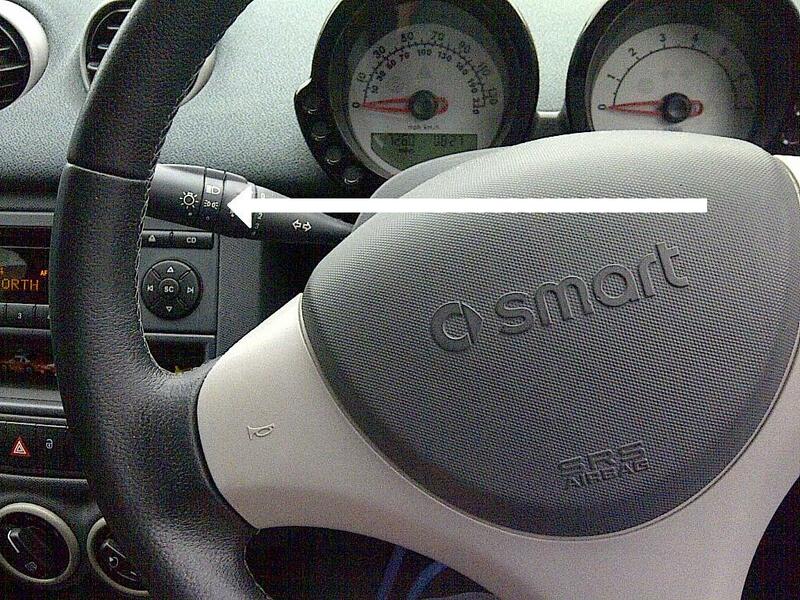 It will generally be a yellow colour as it is a warning light, but the car CAN be driven with faulty ABS. 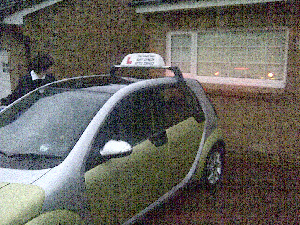 However we at The Smart Way highly recommend it is fixed as soon as possible. 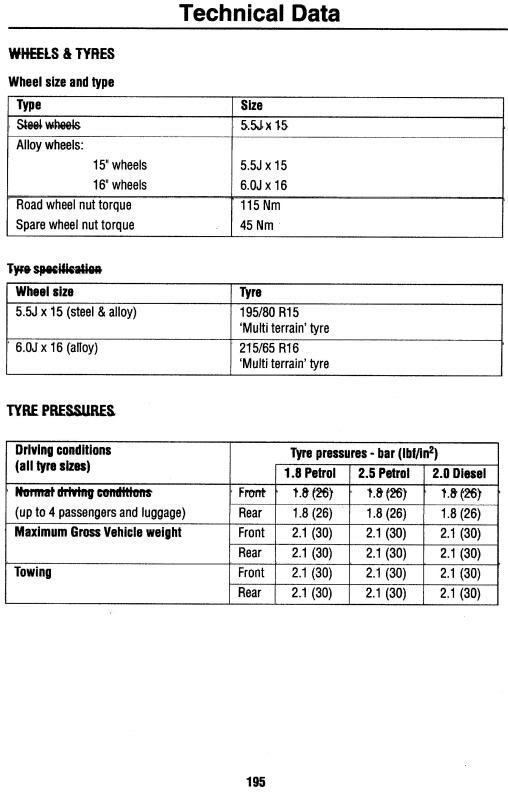 Tell me where you would find the information for the correct tyre pressures for this car and how you would check they are correct. 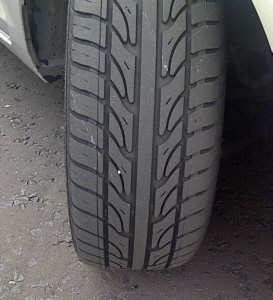 You are not expected to know what these tyre pressures should be, simply to know WHERE to find out the information. You then explain to the examiner that once you know what the pressure should be you would go to a garage with an air line and inflate or deflate the tyres accordingly to the correct pressure. Tell me how you would check the tyres on this vehicle for their general condition. 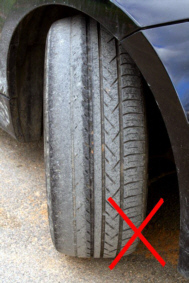 The tyres should have a minimum of 1.6mm of visible tread across the middle 75% of the tyre in a CONTINUOUS band around the tyre, e.g. there can be NO bald spots. 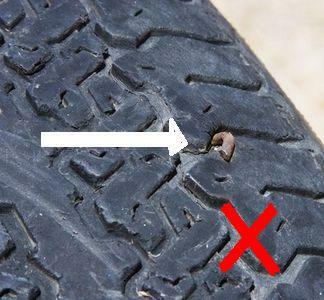 The treads should be checked to ensure there is nothing stuck in them, such as nails or screws. 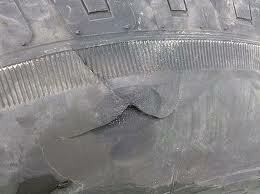 In addition, the sidewalls should be checked that there is no damage, such as splits, tears or bulges. This tyre has split in the sidewall, which will almost certainly blow out. Tell me how you would adjust the head restraints in this vehicle and how you would know when they are correct. 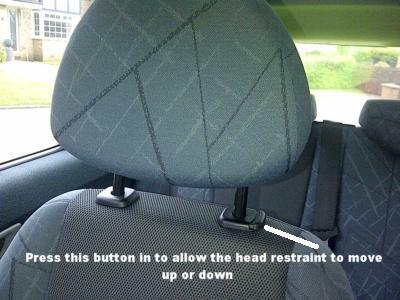 When the head restraint is in the correct position the top of the restraint is roughly level with the top of the head of the person in the seat. There should be no, or minimal gap between the back of the head and the restraint. The restraint is adjusted by pressing in a clip at its base and sliding it up or down as needed, typically as in the picture below (actual details may differ slightly). It is important to have the head restraints in the correct position so as to minimise injury to the neck in the event of accident, in particular being hit from behind (aka a "rear end shunt"). Tell me how you would check the power steering on this vehicle. 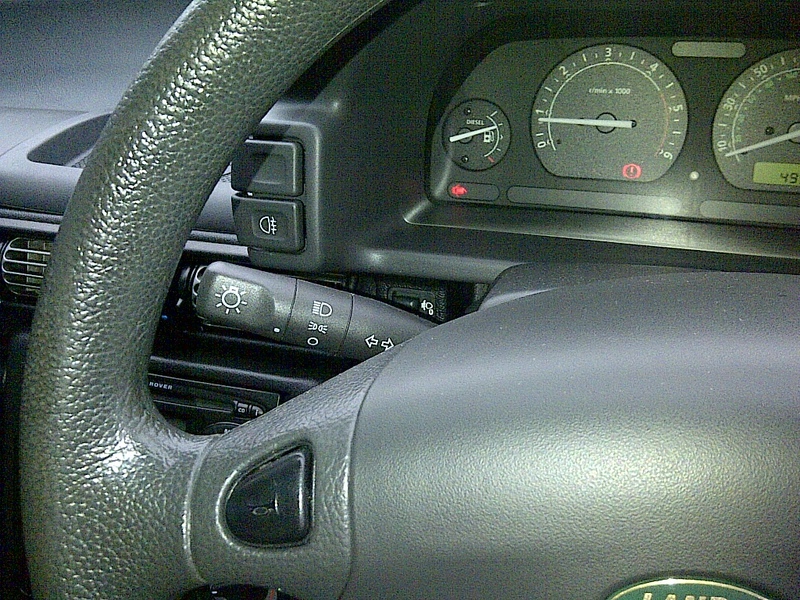 Try to turn the steering wheel with the engine off (make sure that the steering lock is not engaged), it will feel heavy. Try to turn the steering wheel, it should feel much lighter. 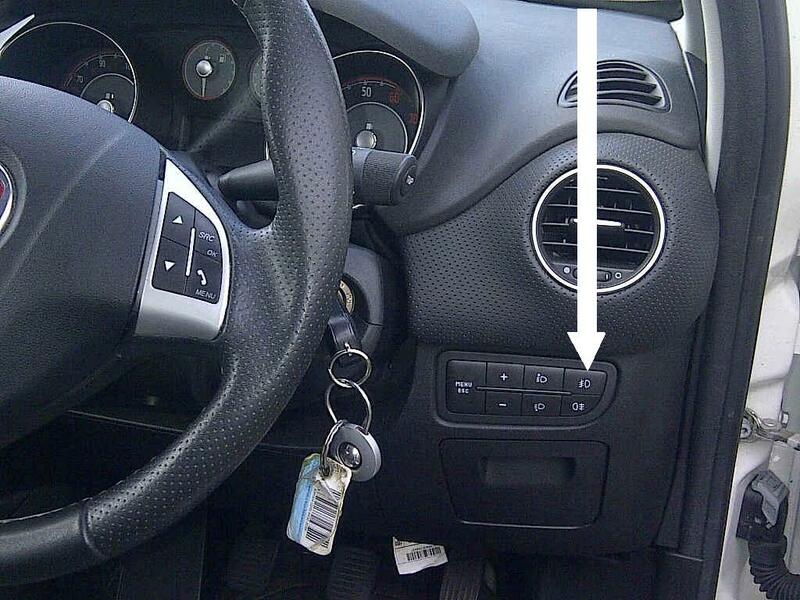 If there is no difference then either the vehicle is not equipped with power assisted steering, or it is faulty. 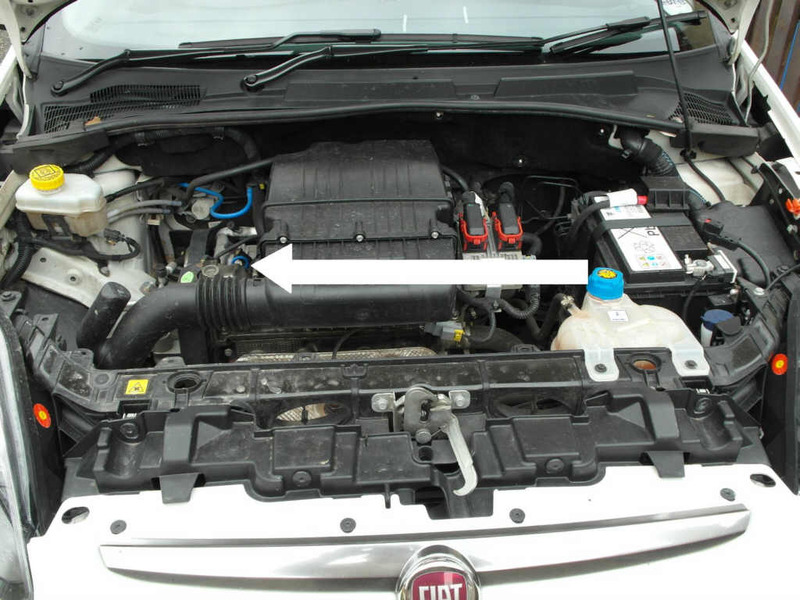 The car CAN be driven with faulty power steering. 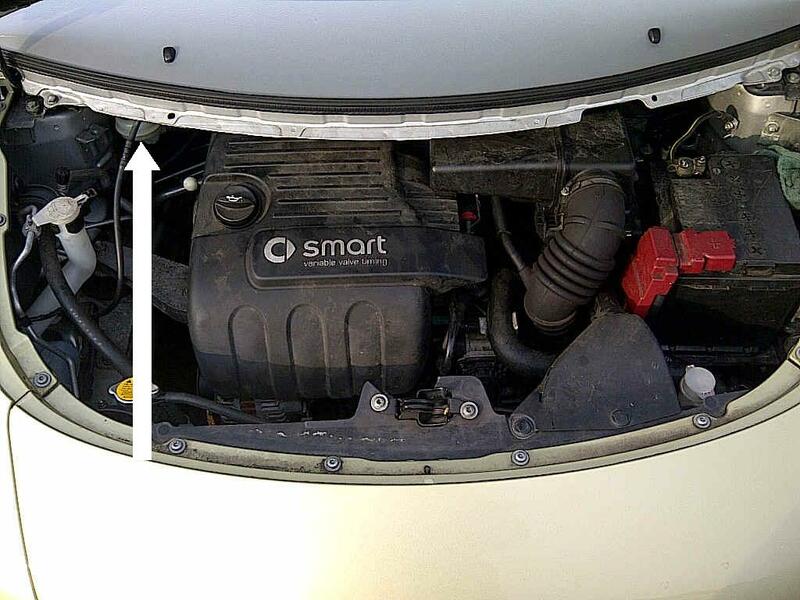 However we at The Smart Way highly recommend it is fixed as soon as possible as the car is designed to handle in a certain way and this may be affected if the power steering is not working. 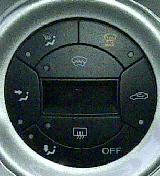 Show me how you would set the demister controls in this car to demist the front and back windows. 2. 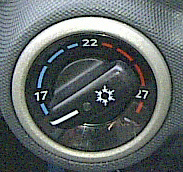 Set the fan speed as needed, in this diagram this is set on speed 2, medium. 3. 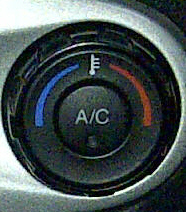 Adjust the temperature as required. When the pointer or marker is in the red area the air will be warm, when it is in the blue the air will be cool. In this picture it is in a cool setting. Generally cool air will clear the windows quickly. 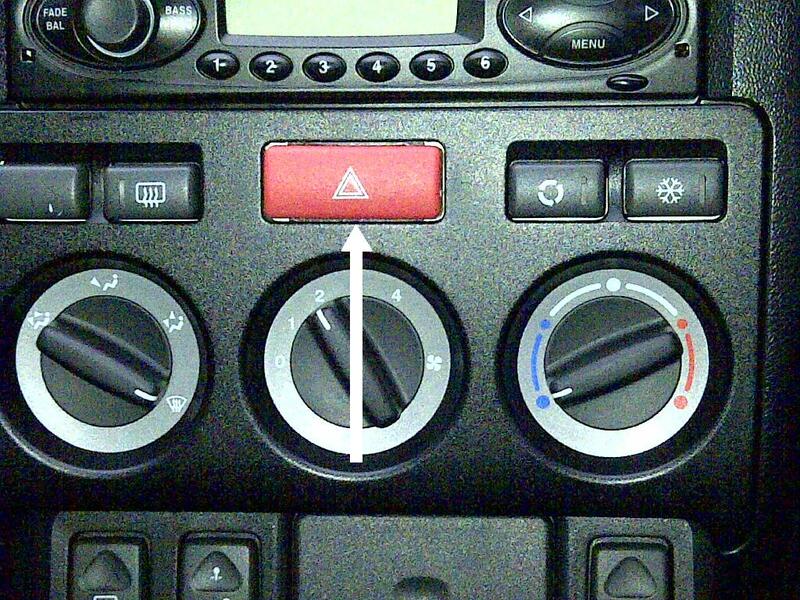 Setting the air conditioning "on" (if fitted) will generally clear the windows quickly and effectively, especially on very wet days, but this does use a lot more fuel. Your instructor will show you how to do this. For the back window the demister is a built in electric heating element. 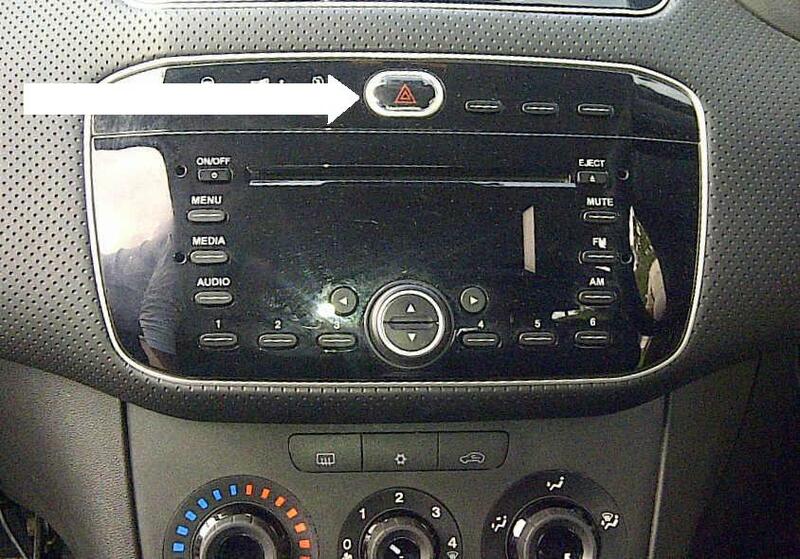 This is switched on by pressing in the switch as indicated below. A yellow warning light will glow when this is on. Do not leave this on once the window is cleared as it is not good for the window. Tell me how you clean the windscreen on this car using the washer and wipers. 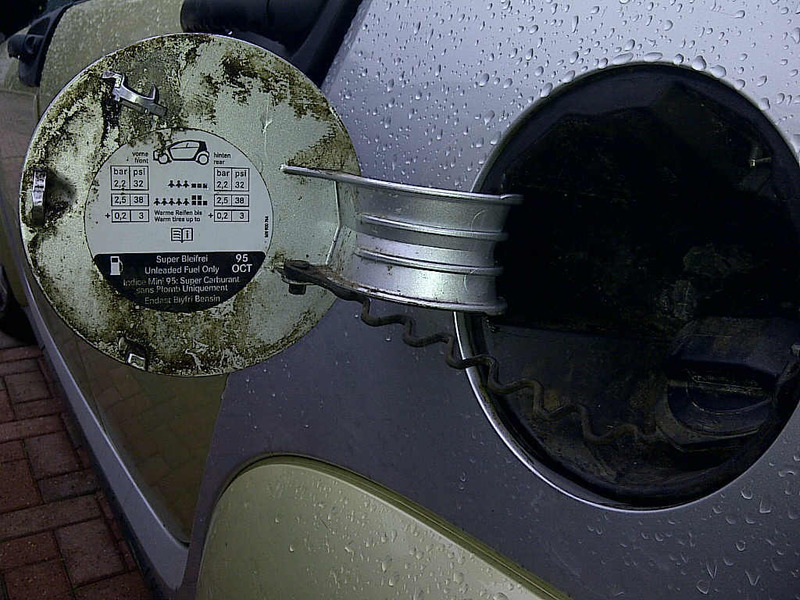 The windscreens should always be kept as clean as possible. When driving sometimes mud or dirt can be thrown onto the windows by passing cars etc. To clean this, pull the windscreen wiper switch (right side stalk switch, like the indicators but on the other side) towards the steering wheel. The �squooshers� will spray water onto the window and the wipers will automatically make 3 sweeps to clean it off. This should not be used as a replacement for cleaning the windows properly when the chance permits. Tell me how you would test the horn on this vehicle. 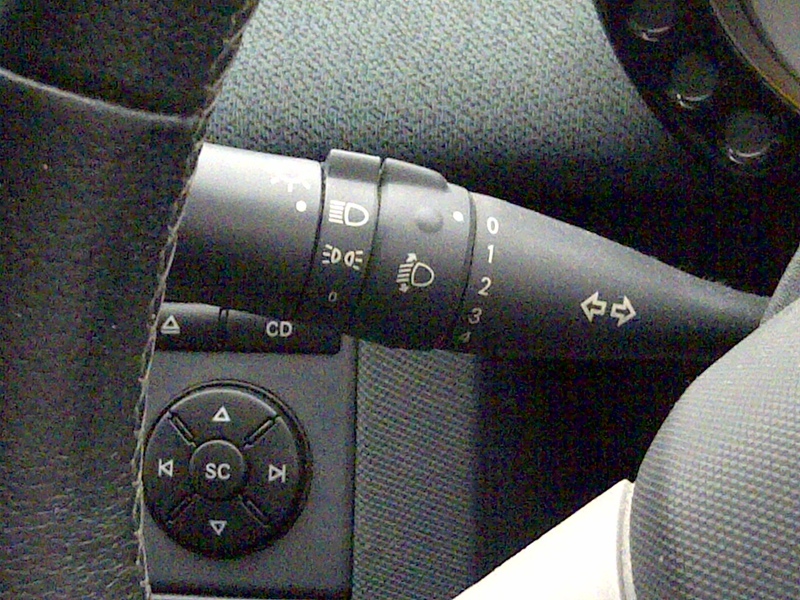 Locate the horn switch for your vehicle (normally but not exclusively the central steering boss). Press this switch and listen for the noise. Not surprisingly, no noise means the horn is not working! If you are starting your test in an off road area (i.e. a test centre car park) you will be asked to "SHOW" this. If you are on the public road you will "TELL" it. Tell me the main safety factors involved in securing a load on this vehicle (B+E test ONLY). The load should (as far as possible) be distributed evenly throughout the trailer. Heavy items should be loaded as low as possible so they don't tip over and also so that they are mainly over the axel(s). Bulkier, lighter items should be distributed to give a suitable �nose weight� at the towing coupling. The nose weight should never exceed the vehicle manufacturer�s specifications. 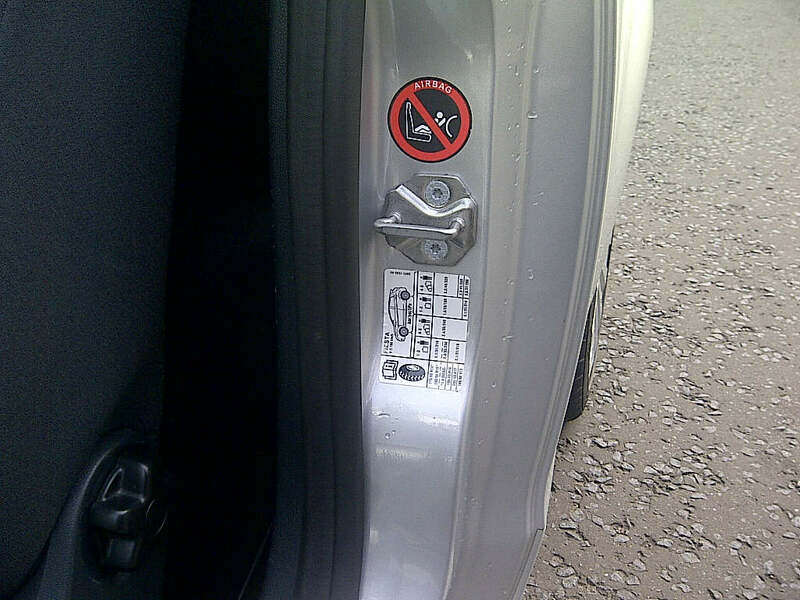 SHOW me how you would check that you vehicle and trailer doors are secured (B+E test ONLY). Walk around the vehicle and physically check that all windows, roof lights and all doors (especially cargo doors) are properly closed, secured and cannot come undone during your trip. An amusing photograph perhaps, but not acceptable on the roads in the UK. Download printable copies of this page. To download printable copies of these sheets, select your instructors vehicle from the list below, and download to your own computer, tablet device or smart phone, where you can read them at will or print them for easy reference.